Hi Ron, Thanks for the review of the P5000 printer. I have several pressing issues that I would need to know and have found the staff at Epson has no answers for me. Any insight on the following would be greatly appreciated. 1. I'm a textile designer I need the widest color gamut, darkest blacks, true greys and bright colors. Matching to pantones is a secondary concern and not really an issue. Which printer/set of inks (standard or designer) do you feel would satisfy my needs the best. Keep in mind that even though I'm a designer that it doesn't mean the designer edition would be best for me. As of now I'm using the 4900 for artwork with neutrals and the artisan 1430 when I need bright reds and silky dark blacks. 2. Cost per print. I know this is a tricky one. If the cost could be compared to the 4900 (or even the old 4880) it would be a great help to all struggling artists. Just about all our profits go into ink & paper. 3. How is the paper handling for cut sheets? Also very important. Sorry for the delayed response. This wasn't my official review - it was just a product announcement along with my first thoughts based on what I know so far. 1. This printer is supposed to offer the widest color gamut that Epson has offered, so if you found the 4900 insufficient then either you need a better ICC profile or perhaps this might not be the right product for you. I do find that my Canon PRO-1000 and PRO-2000 printers (see my reviews via the printing tab) have ICC profiles with warmer tones, so you might want to get a sample print and see how that compares. Epson's do tend to be more neutral so you'll need to compensate for that in the source image or by generating your own ICC profiles. 2. I can't help you there as there are just too many variables. Using Red River paper (see my printing tab) can help lower your paper costs, but I always recommend 100% original Epson inks. 3. I haven't tested this printer first hand so I can't comment on that yet, but everything I've seen so far sounds like the P5000 will behave very similar to the 4900 when it comes to handling sheet paper. My Canon PRO-2000 is WAAAAAAAAY better in this respect as it's a large format printer that handles single sheets of paper beautifully. It also supports two rolls of paper at once (with optional extra roll feeder) and can print sheets without the need to remove the roll. It also makes loading roll paper much easier than anything I've ever owned). I expect this to be a good printer that will please Epson fans, and with Epson's excellent papers I think the results you can get with it will no doubt be exhibition worthy. However,it sounds like you might like the accounting manager feature of the Canon PRO-2000 to know your exact cost per print as well as it's better support for single sheet paper (get the PRO-1000 if you do > 1 sheet at a time) and its warmer ICC profiles. is it possible to get some color reproduction comparision between this Epson Printer and Canon imagePROGRAF PRO-1000? 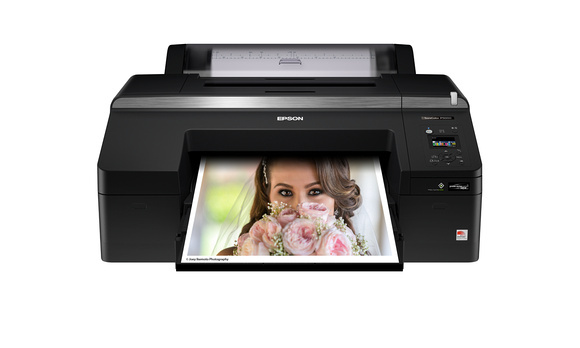 i am new to larger printers and was comparing the Epson sureColor P800 to Canon imagePROGRAF PRO-1000. I almost bought the Canon imagePROGRAF PRO-1000 but now when the Epson SureColor P5000 is available I am waiting for some review/ comparision between P5000 and Canon imagePROGRAF PRO-1000. You've come to the right place as I've already done the first part of my review of the PRO-1000 and the long-term report will have image comparisons. I'll also be getting a P5000 later in the year - in addition. I'm also a P800 user. I can tell you now that the ICC profiles generally tend to favor warmth on the Canon PRO series printers whereas Epson's tend to have a neutral color balance. It's like comparing Canon DSLR's (warm AWB) to Nikon (default neutral white balance) in camera results. Canon's generally feature a nicer user interface, features and cost accounting in the driver UI versus the more Epson UI. However, if you work hard to get an apples to apples comparison (or you use ColorByte ImagePrint) you'll see that both are capable of results that are extremely difficult to distinguish. You can't go wrong with either one. That said, the P5000 is not for occasional use so if you aren't planning on printing nearly daily (and at least weekly) then I think you'd be better off going with a P800 and the roll option or the Canon PRO-1000 if you can live without the roll support (or PRO-2000 if you want roll support and a printer that works fine with occasional use). Thank you Ron for quick feedback. I bought the P5000 to replace my 4900. The head was clogged on the 4900 and just wasn't responding to anything I was doing and I had an exhibition coming up that I needed to print for. I love the P5000 and have no regrets, but unless I am not looking in the right place, Ilford has not created an ICC profile for the Gold Fiber Silk paper - or any of their papers for the P5000. Should I just wait for them or is there some other solution? I'd like to be able to keep my prints consistent with the same paper, but for now, I am using Ilford paper. I'd suggestion you contact Ilford support and ask them to create one. I can tell you that customers are able to get them faster than reviewers and partner companies which is why you'll see a delay. Ron- Thanks for your review of the P5000. I was intrigued by Epson's comment this unit is not WiFi enabled for "performance/reliability reasons." I use WiFi on my Epson P800, but I've been wondering if there is a print quality loss when using WiFi instead of a USB cable. I can't find any research on this. My intuition tells me that there must be a difference, but perhaps it's imperceptible to the human eye. But perhaps on large prints one might see a difference? Would love to hear your thoughts. Thanks. 1. Does this machine uses the same system of changing inks between matte and photo (like the 3880)? 2. Is the ink expense comparable to the 3880? I am the owner of a STYLUS PRO 4900. As many others, I love the quality of the prints, but I have experienced many problems with the printhead. Now, fix my printer is more expensive than buy a new one. Initially, I decided to buy the successor: surecolor p5000. However, I think I will buy the p7000, in order to print bigger pictures. The quality between P5000 and P7000 is the same in both? Do you thing that EPSON has really improved clog problems in these new printers?